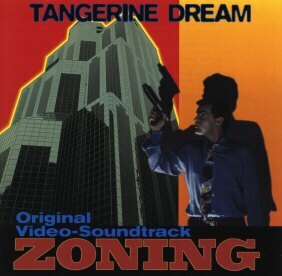 For many years Tangerine Dream have been very much into the soundtrack business, and most of them have been released on CDs. In early 1996 appeared one of their probably most surprising releases. Zoning is a German thriller produced 1986/87, which could be seen on TV screen for a few times only and then disappeared. Without any information before, it had been re-released in the video format nearly ten years later, accompanied by a soundtrack CD with the music of TD used for this video. Edgar Froese had recorded and mixed the whole score in 1994, eight years after TD produced the first version of this soundtrack. Thus, most of the music on this CD sounds quite different from the original film score; the musical style fits more into the previously unreleased material from Edgar Froese's Beyond The Storm. In fact, the track Eyewitness News on Zoning was taken from Beyond The Storm where it had been titled Descent Like A Hawk. More information about this movie is available at The Internet Movie Database.